The Senate of Virginia is the upper house of the Virginia General Assembly. The Senate is composed of 40 Senators representing an equal number of single-member constituent districts. The Senate is presided over by the Lieutenant Governor of Virginia. Prior to the American War of Independence, the upper house of the General Assembly was represented by the Virginia Governor's Council, consisting of up to 12 executive counselors appointed by the Colonial Royal Governor as advisers and jurists. The Lieutenant Governor presides daily over the Virginia Senate. In the Lieutenant Governor’s absence, the President pro Tempore presides, usually a powerful member of the majority party. The Senate is equal with the House of Delegates, the lower chamber of the legislature, except that taxation bills must originate in the House, similar to the federal U.S. Congress. 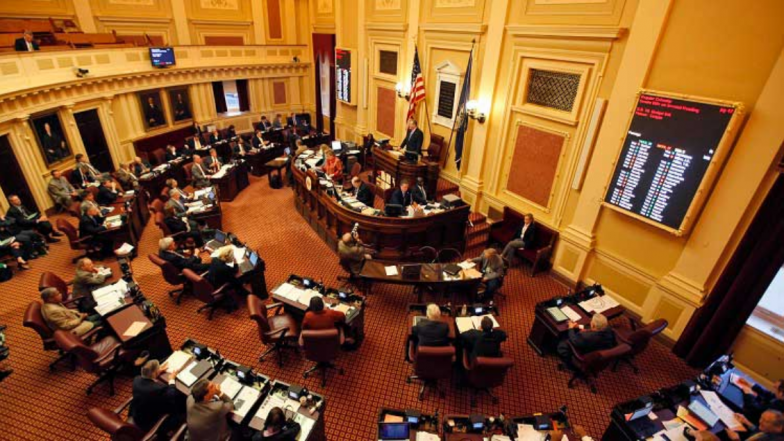 Members of the Virginia Senate are elected every four years by the voters of the 40 senatorial districts on the Tuesday succeeding the first Monday in November. The last election took place in November 2015. There are no term limits for Senators. In the 2007 Virginia state elections, the Democratic Party reclaimed the majority in the Senate for the first time since 1995, when the Republican Party gained a 20–20 split. The Republicans took control of the Senate for the first time in history after a January 1998 special election. The 2011 elections resulted in a 20–20 split between the parties, but as the tie breaker was Republican Lt. Governor Bill Bolling, the Republicans effectively regained control. After the 2013 elections, Democratic State Senator Ralph Northam became the Lt. Governor, but the Democrats did not regain control of the chamber until January 28, 2014, following a series of special elections including that of Northam’s vacated 6th district seat. The Democratic majority would prove short-lived, however, as Senator Phil Puckett (D-38th) resigned, effective June 8, handing the GOP a majority of 20 to 19. The Republicans solidified their majority following a special election win on August 19, 2014, which increased their total number of seats to 21. The Senate of Virginia was created by the 1776 Constitution of Virginia, and originally consisted of twenty-four members. Along with the House of Delegates, the Senate comprised a new bicameral legislature designed to replace the colonial Virginia House of Burgesses, which formally dissolved on the sixth of May, 1776. Pursuant to the original Virginia Constitution, the Senate was only permitted to file amendments, while the House of Delegates had the power to propose bills. Accordingly, the Senate had far less power than the House, until the revised Virginia constitution of 1851 allowed the Senate to propose new laws. The annual salary for senators is $18,000 per year. To qualify for office, senators must be at least 21 years of age at the time of the election, residents of the district they represent, and qualified to vote for General Assembly legislators. The regular session of the General Assembly is 60 days long during even numbered years and 30 days long during odd numbered years, unless extended by a two-thirds vote of both houses. The Senate of Virginia has 10 Standing Committees and a Committee on Rules. The Senate of Virginia has its own coat of arms designed and granted by the College of Arms in England. The coat of arms also makes up the official seal of the Virginia Senate. It bears no resemblance to the Seal of the Commonwealth of Virginia, which is the seal of the state as a whole. The Coat of Arms of the London Company. The coat of arms adopted January 22, 1981 was designed by the College of Arms and based on the coat of arms used by the London Company, the royally-chartered English entrepreneurs who funded the European settlement of Virginia. This is not to be confused with the Seal of the London Company, for other than both devices displaying a quartered shield, there is little resemblance between them. The Senate’s arms have a shield in the center which is divided into four sections by a red cross. In each quarter are smaller shields representing the arms of four countries (England, France, Scotland, and Ireland.) that contributed settlers to Virginia’s most early waves of European immigration. The four coats of arms, a small crest of a crowned female head with unbound hair representing Queen Elizabeth (the Virgin Queen who named Virginia, and the dragon (part of the Elizabethan royal seal of England) represent Virginia’s European heritage. My name is Zach Villegas. I am the lead curator for this Virginia State Senate post.